We've been at sea for over five days, but somehow it doesn't seem that long. Everyone aboard has been incredibly busy getting ready for tomorrow, our first day on site. The scientists have assembled their instruments and sampling gear. 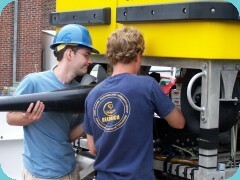 The ROV team has been preparing the vehicles. All of the equipment in the control van has been set up and tested. Meanwhile, the production team has been setting up and practicing for the live broadcasts. Before we get to the Lost City site, we are making a stop at another site farther west. Because our first site is farther from the spreading center at the Mid-Atlantic Ridge, the ocean floor here is older than at Lost City. The team hopes to explore this first site to see if it also has a hydrothermal system. If all goes well, the plan is to launch Argus and Hercules in the morning to see what is down there. This evening we learned that we should arrive at our first stop a few hours ahead of schedule. The science teams on the ship and at the University of Washington called a meeting using the satellite link so they could discuss the plan for the morning. Meanwhile, on deck, the ROV team continued preparing Argus and Herc for their first dive. As the sun set, most people were still working, and we know we'll all be up bright and early in the morning. Copyright © 2004-2017 JASON Learning. All rights reserved. The Immersion Learning program is a division of JASON Learning.